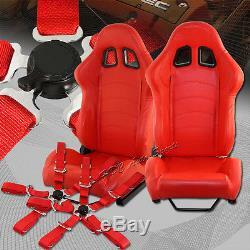 TYPE-1 Red PVC Leather Red Stitch Racing Seats + 5PT Red Seat Belts Universal 1. Model: Universal for all vehicles. 2 x Racing seats with universal sliders (Driver's side+Passenger's side). 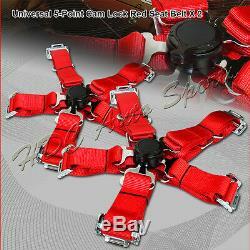 2 x 5 Point harness seat belts (Driver's side+Passenger's side). INSTALLATION INSTRUCTION IS NOT INCLUDED. 100% Brand new never used or installed. Made From High Quality PVC Leather. Durable steel for protective grip on outer lining. Deep thigh bolsters to keep you firmly place within your seats. Gives supports from the shoulder to the lower back. 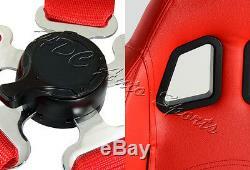 Seat belts have 2 heavy duty nylon with quick release cam lock. Double adjustable ends seat belts. Drop forged alloy steam with cadmium plating seat belts. Lower back width- 11.5. THIS PRODUCT RECOMMENDS PROFESSIONAL INSTALLATION. We will try our best to assist all our customers, however we only have limited technical knowledge because we only sell the items provided by our vendors. If no one picks up, all available customers service are currently on the line. Please call back and try again. Powered by SixBit's eCommerce Solution. 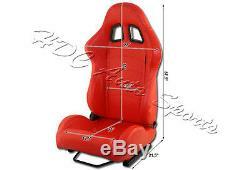 The item "TYPE-1 Red PVC Leather Red Stitch Racing Seats + 5PT Red Seat Belts Universal 1" is in sale since Thursday, August 25, 2016.